You are currently browsing the tag archive for the ‘green walls’ tag. Green wall in Petersham – a very nice way to prevent tagging. It already looks good & will look very attractive once the vines have grown. Compare with this just down the road. 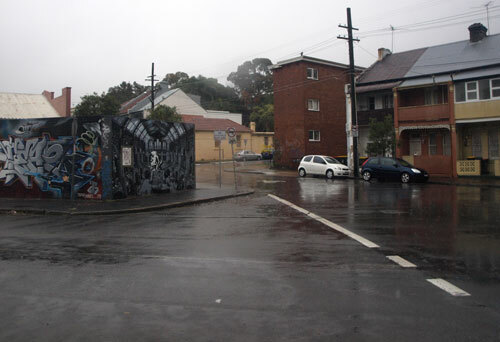 This is becoming a common sight across Marrickville municipality. 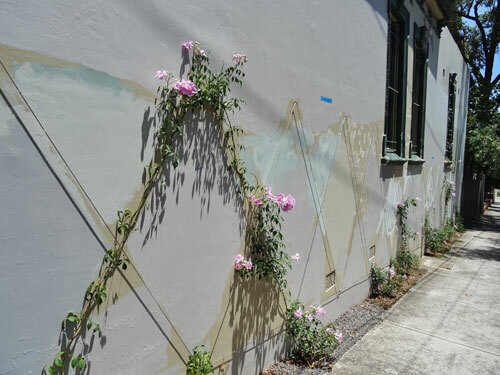 I was driving down Audley Street in Petersham recently when my eye caught what I thought was espaliered climbing roses on an exterior wall of a corner house. I returned a few days later to have a good look. It wasn’t roses, but Pandorea jasminoides. What a great choice. This vine is a vigorous grower & very suited to covering walls or fences. The large tubular pink flowers cluster in the way same as roses & flower between spring and late summer. The vine will cope with Sydney’s changing climate being very hardy in both temperate & tropical regions. It also tolerates dry periods once established, making it very suitable for a hot wall covering. Pandorea jasminoides is a soft vine, so pruning is easy & not needed too often. Especially wonderful is that it is an Australian native in New South Wales & Queensland. They had removed a section of the footpath outside the exterior wall of the house. 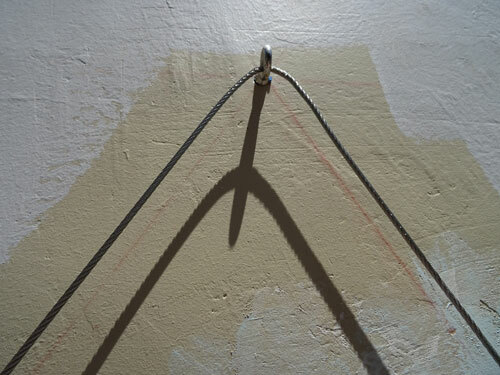 On the wall, stainless steel wiring had been attached with hooks. The wiring had been attached in a diamond shape across the lower section of the wall. I would guess this is a recent planting as the vine is still young. Give it a year or two, & the whole lower section of the wall will be covered with a beautiful flowering vine leaving no room for graffiti tagging. That is a winning move in my opinion. I don’t know if it is just my perception, but Marrickville LGA seems to have a lot more tagging of late & a lot of areas are looking shoddy because of it. After seeing this work, all I can see is other buildings that could benefit from a similar treatment. How pretty the municipality could look if this was the norm. It is a reasonably cheap method to graffiti-proof a building. I assume that the owners here used stainless steel wiring because they wanted it to look the best that it could. However, you could do the same thing with any kind of wiring, as long as it was strong enough to hold a heavy vine. The major issue is the removal of the concrete footpath. Marrickville Council will do this for a fee, which includes checking for underground infrastructure & taking the concrete rubble away. When you factor in the cost & time needed to keep repainting over graffiti tagging, I think it is worth getting a permanent & beautiful solution. Something else that caught my eye was that they had also built their fence around a part of a tree trunk. I am always impressed when I see this & have written a couple of posts of the same in the municipality. I really like to see trees respected in this way. This too looks good. As I benefit from the work they have done, I thank them for this & the vine. I can’t wait until the vine grows so I can see the outcome. 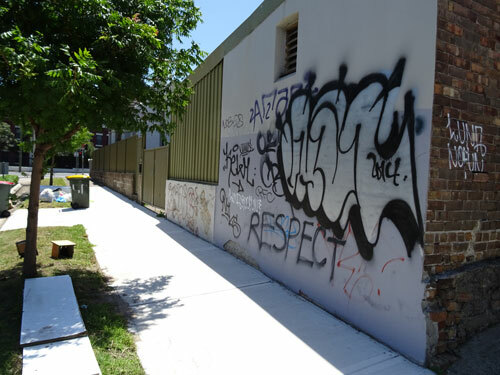 Still on the subject of graffiti-proofing a wall, I have seen the same treatment done to the exterior wall of a toilet block in Beaman Park in Earlwood. 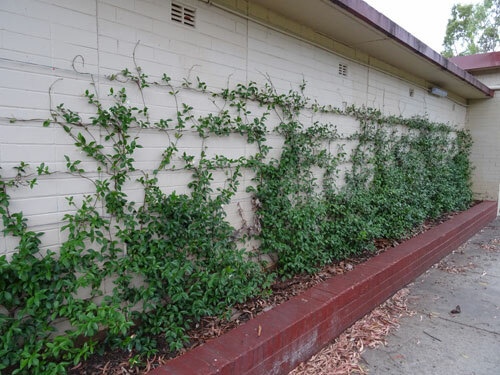 Here Canterbury Council has used Chinese star jasmine (Trachelospermum jasminoides) & ordinary wire to train a few plants to grow up & across the wall of the toilet block. This is a hardy, evergreen, twining climber that has masses of small, white beautifully scented, star-shaped flowers in spring, thought it can spot flower at other times during the year. It will flower in full sun, partial shade or total shade. 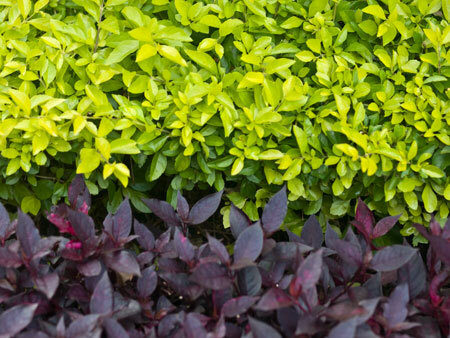 One plant can cover an area of 6-metres by 6-metres, making it a very cheap option. Star jasmine will happily grow in a pot. Marrickville Council uses Star jasmine as a ground cover in landscaping all over the municipality. The toilet block in Beaman Park Earlwood. I think this is a fantastic way to graffiti-proof a wall. I am biased because I prefer natural things. Stainless steel wire setup in Petersham. 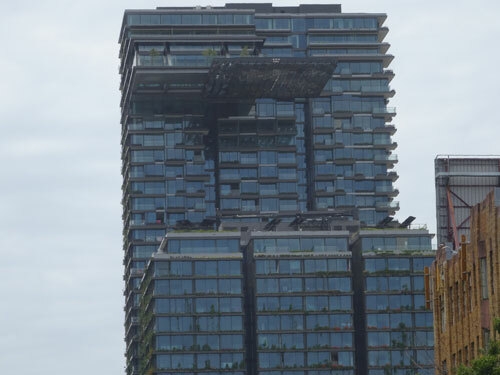 One Central Park is already a prominent building. Imagine when it is all green. I am in love with this development. Drive up Broadway towards the city & your eye is drawn to this building. I think this is an exciting development for Sydney. 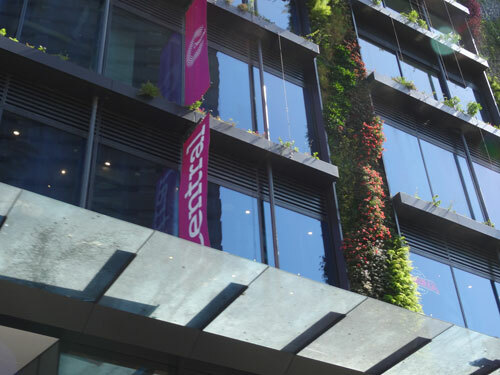 One Central Park is the world’s tallest vertical garden comprising of 21 panels. These panels contain 30,000 shrubs & 70,000 plants, made up from a selection of 360 plant species. Hibiscus, Olive & New Zealand Christmas trees are growing on the sky garden, while the cantilevered heliostat reflects light to the gardens below. If there has to be high-rise, make sure the buildings improve livability. Ensure these buildings enrich the neighbourhood. 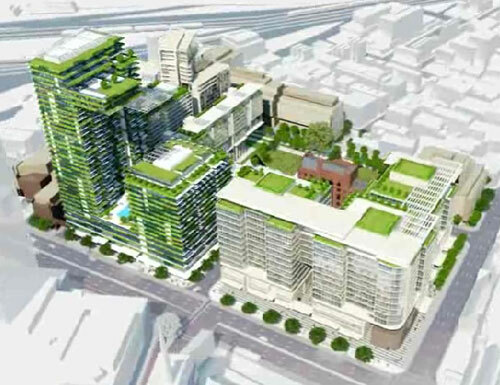 Insist that developments are sustainable & have ample green space. Make certain they do not become the ghettos of the future. One Central Park is doing all of this & more. “…… suddenly you will find yourself in a place where you are not near cars, where you can only hear voices, and there are chairs, benches, trees and flowers. If you are working and living in the city, you need these breaks.” ~ Jeppe Aagaard Anderson, Landscape Architect & co-creator of the parks & landscapes at Central Park. A closer look. Sorry, these are not good photographs. I was a passenger in a moving car. Vertical gardens that still have more growing to do. I am impressed that all the street trees were saved. A closer look at the mirrors. They have even included colourful plants. These look to be red Begonias, almost a signature plant around the CBD & Glebe in hanging baskets installed by City of Sydney Council. Looking west. SHINE is quite appropriate. The old Brewery is being restored. Underground street lights will allow decent sized street trees. This structure in the porch opened my mind to the idea of small green walls. I think they have been very creative & I can’t wait to see this when it is fully grown. I recently spied an ingenious way to install a green wall in a very small space – literally at the entrance of a house beside the front door. A lightweight metal structure, used I think to stabilize & reinforce the concrete when forming cement slabs, has been fixed to the brick wall. A Star Jasmine vine is being trained up through the metal & will very quickly hide as well as pad the structure transforming this area into a green wall. Not only have they repurposed the metal structure making this a sustainable approach, the green wall will also help lower the heat of their front porch & at least part of their house in summer as they face west. The green wall will add significant beauty making a nice entrance & also a cool green porch to sit in if they wish. Star Jasmine is very quick to grow. It is soft to touch & can be cut back easily. In the weeks around Christmas, this wall will be covered in highly perfumed white flowers, which will probably fill the house with a lovely scent. I think this is a terrific idea that can easily be done on other walls & structures. 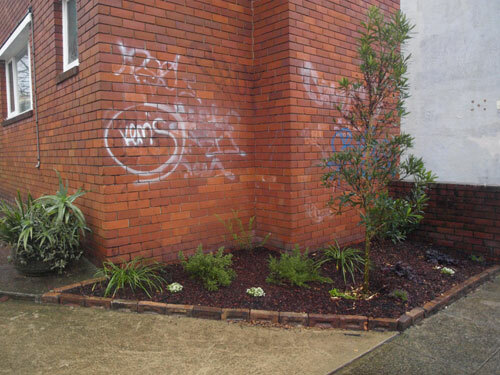 Recently I attended a verge garden workshop run by Marrickville Council. We were shown a Photoshop mockup of similar plans for an exterior wall on a corner property to stop the constant graffiti tagging. 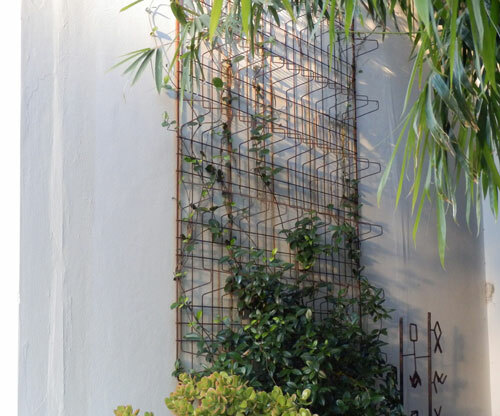 Lightweight metal gridding standing a few centimeters from the wall will be attached & a couple of vines like Star Jasmine planted in the ground & trained up to cover the wall. Within a short time this will become a green wall & probably the pride of the local community. Because the metal structure will not touch the wall, except for the attachment points, there will be no problems with rising damp or any other damage. It looked terrific & appealed to all the participants. Sydney City Council has done much larger versions under the overhead roadways near the Fish Markets & along the railway line in Erskineville & these green walls look fantastic. It’s fairly cheap to do, Star Jasmine is long-lived & easily managed & pretty much everyone likes green walls, including wildlife. It will also permanently stop tagging. 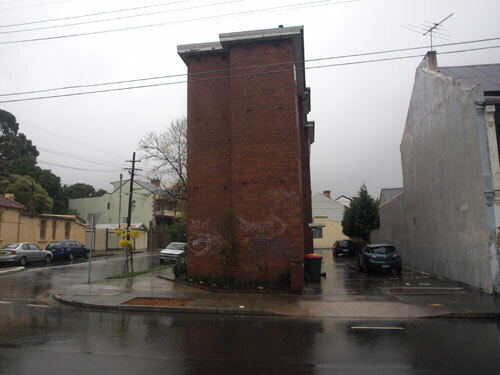 Imagine how Marrickville LGA could look if the exterior of buildings on corners & laneways were to become green walls. They soften harsh landscapes, lower the urban heat island effect, offer habitat for small birds, lizards & insects & add beauty for the eye. 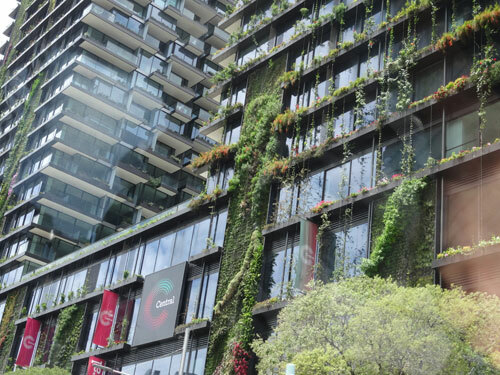 Sydney to have the world’s tallest vertical garden! 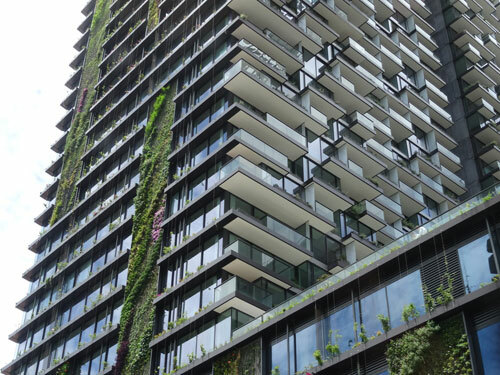 Can you imagine a 110-metre-high apartment complex with the walls covered in 100,000 native & exotic plants? 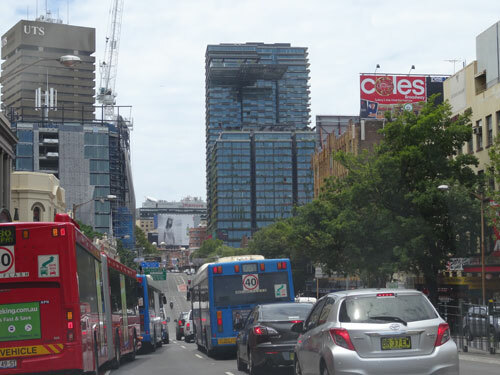 Well it is about to happen at One Central Park, the new retail/residential area called Central Park at Broadway in Chippendale due to be completed in 2013. 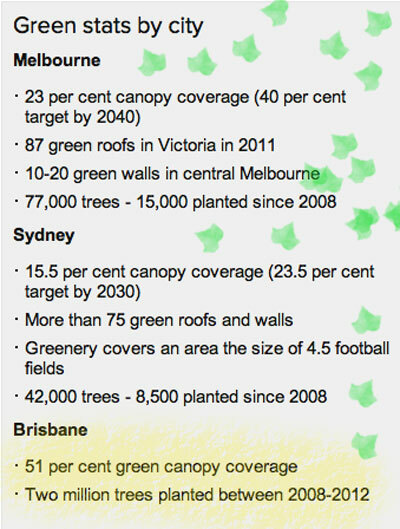 The City of Sydney Council is currently setting up a Green Roofs & Walls Strategy. 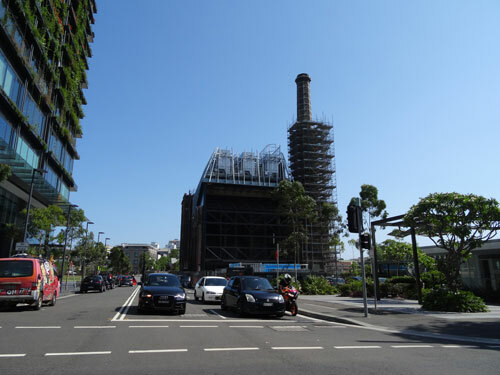 This tells me they have great plans to incorporate these green initiatives into new developments as part of their overall plan to green the city & suburbs that make up the City of Sydney LGA. 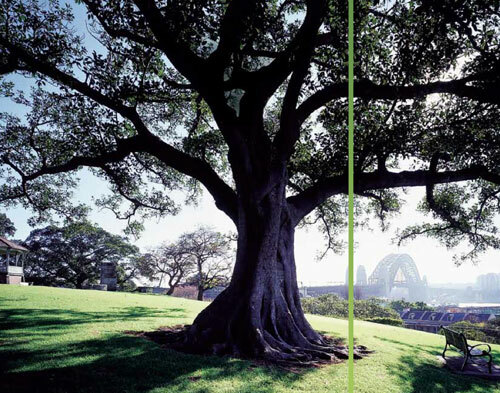 When I read what the City of Sydney is planning for greening the city & suburbs, I feel happy as this is my city too & I do have an emotional investment. I also wish that the City of Sydney’s attitude to innovative strategies for greening the environment flows through to my own Council. I hope that the new developments that will be springing up throughout Marrickville municipality will have visible green features & an emphasis on making people-friendly places. 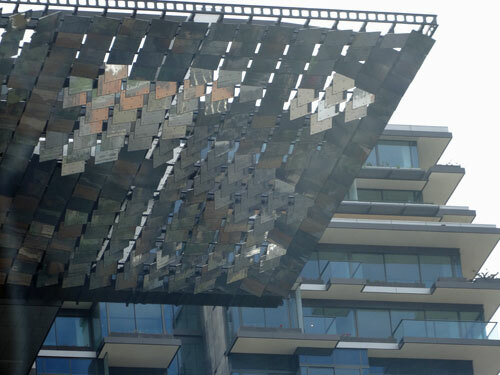 Photo of the artists image of the One Central Park complex published in the Sydney Morning Herald with thanks. Imagine how good this development will look. There has been some great collaborative work done between Marrickville Council & local community group The Phillip & Gladstone Street Pride Group. 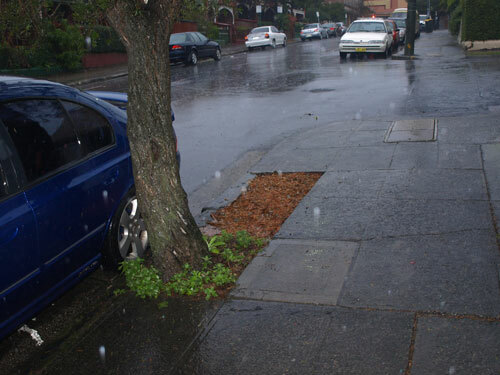 Marrickville Council has, on the request of the group, created 12 new tree pits & verge gardens on Phillip & Gladstone Streets in Enmore. Apparently there was a lot of concrete & rubble once the surface of bitumen had been removed & some of the pits needed quite a lot of work to clear them. Council had originally planned to plant Water Gums along here, but apparently don’t have any in stock so may be planting Banksias. The decision isn’t final as the residents have asked for Blueberry Ash trees to be planted instead. Apart from the 12 new verge gardens Marrickville Council has extended a number of other verges, including those around the 3 trees next to the new mural on the Alfalfa House building. The Phillip & Gladstone Street Pride Group will manage these as well as the other verge gardens. 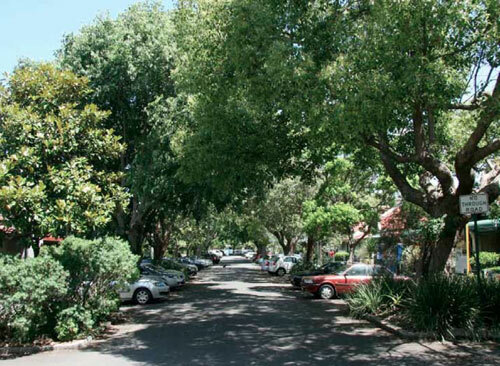 12 new trees are planned for Phillip Street & verge gardens are being created around existing street trees. This will do a lot to soften the landscape. Council is also contacting Railcorp on behalf of the group to request that a structure to create a green wall be allowed to be installed along the awful brick wall that runs along the railway line. If Railcorp say yes, & I can’t see why they shouldn’t as any structure would not damage their wall, then it will do much to make this area look softer & green. The wall is painted an ugly brown & is a magnet for taggers. 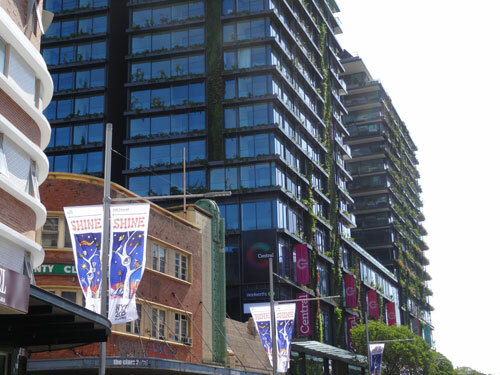 City of Sydney Council have many green walls along rail lines & along major roads showing that they are easy to install & grow well with out the need for much maintenance. 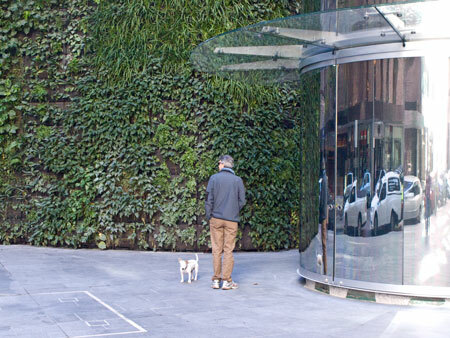 A green wall is something the group could maintain quite easily, especially with soft vines & it would make a tremendous & positive difference to the streetscape benefiting the local community. It would be a good advertisement for Railcorp’s relations with the community as well. Showing the work already done by the residents outside the unit block. The owner of the unit block on the corner of Phillip & Charles Street met with the group & kindly agreed to remove the concrete on the Phillips Street side of the building. The group has already planted out this garden & intends to remove the graffiti tagging on the wall as well. Council helped further by creating a verge garden outside this building on Phillip Street & will plant a street tree. This will in time soften the building, which is a prominent feature in the street. Both the trees & the gardens will benefit the owner by increasing the value of his property. Last week the Phillip & Gladstone Street Pride Group contacted me with very good news – Marrickville Council awarded them a grant of $500 to help pay for the plants for their verge gardens. Congratulations to the residents who have worked hard here & thanks to Marrickville Council for supporting such a great community initiative with money, machinery, advice, new trees & new verge gardens. Hopefully the positive collaboration between residents & Marrickville Council will encourage other such groups to get established across Marrickville LGA. 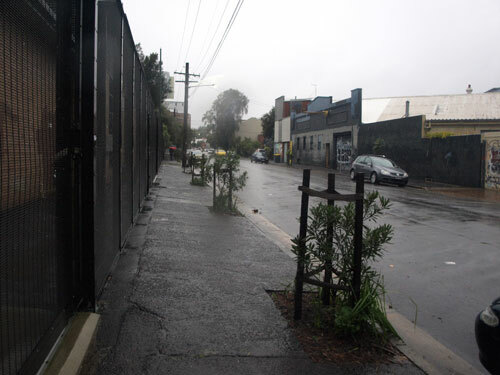 Marrickville Council extended all of the verges around the new street trees planted in 2011. 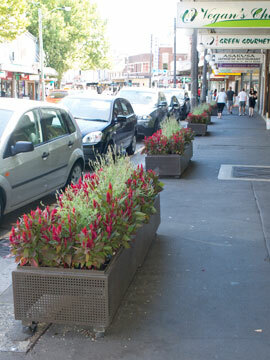 On the City of Sydney Council end of King Street Newtown there are planter boxes spaced around every 4-5 metres. They look great adding colour & beauty. Even if Marrickville Council's budget doesn't stretch to seasonal flowers, planter boxes along Station Street could be filled with longer lasting & hardy plants such as lavender. I like the filtered drinking fountain, the new street trees, the park bench, the disabled parking space & the 2 raingardens. I question the location of the disabled parking space on Schwebel Street as it is almost as far away from the railway station as you can get. I think Council wants this one space to provide for both the railway station & the shopping strip. The loss of parking spaces on Station Street would concern me if I had a business in this area. Hard surfaces are a strong feature in these plans. Black pavers will be put on the footpath on 3 sides of the block & on a new footpath across the road & infront of the railway station. Porous pavers will be placed in the car parking spaces & the road surface at the entrance to Station Street. The full length of Station Street adjacent to the railway station will be terracotta-coloured paving instead of the current bitumen & the rest of Station Street will be resurfaced with bitumen. While pavers are okay, I think they cost an extraordinary amount of money & will become dirty with globs of chewing gum within months. 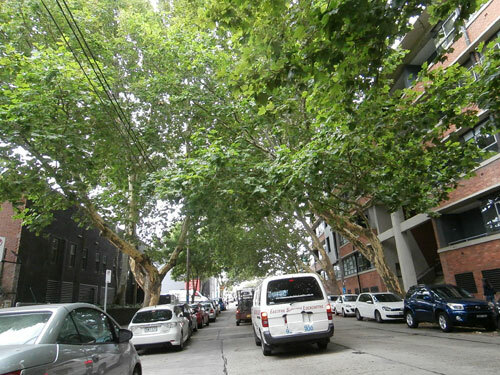 4 tree pits will be created for 4 new street trees… or there could be 6 new street trees. The plans are not clear to me just how many trees & which species of tree goes in what place. I think Lilly pillies (Syzgium luehmanii) will be planted along the first section of Station Street before the railway station, 2 on each side. I think 1 Callery pear (pyrus calleryana) will be planted in each of the 2 raingardens situated on the corner of Station & Schwebbel Streets & the corner of Leofrene Street & Schwebbel Street. I think. Raingardens across Marrickville LGA don’t usually include trees, especially taller growing trees, so it might be just 2 Lilly pillies & 2 Callery pear trees, not 6 trees all up. A hedge of Photinia ‘rubens’ will be planted in 45-metres of new garden bed beside the wall that runs along where Illawarra Road travels over the railway line. My concern about this hedge is, being an Asian exotic, it offers nothing for wildlife, though it would be better than the current dirty brick wall. The plans include a new footpath next to the hedge & along the fence line of the railway station. I suspect very few people will use these footpaths as most exit the station & walk along the footpath outside the shops on Station Street or cut across the street in a long diagonal sweep to get to the pedestrian crossing at the corner of Schwebel Street & Illawarra Road. The new footpath area is currently a drop-off & pick-up zone. Many more vehicles use it than what is to become a 3 car & 2 motorcycle parking area. The plans to narrow the street will make drop-offs & pick-ups a cause for blockages of the street & inevitable arguments. Waiting cars will likely move to Schwebel Street creating different problems. I suspect the hard surfaces alone will amount to the bulk of the plan’s budget though there is no indication how much these works will cost. Instead of spending money on pavers the budget could be spent on large planter boxes to surround 3 sides of this block of shops & apartments. I’d also copy City of Sydney Council & install large hanging baskets of red Begonias at regular intervals….planter box, hanging basket, planter box, hanging basket etc. Living colour would have a much greater & pleasant impact on the streetscape than pavers & be visible from a much greater distance. These photos show how little actual space is needed to create a living structure that greens up the area & adds significant beauty. The benefits of green walls are many. I’d like to see a tall steel trellis structure placed outside the length of the railway station fence instead of a new footpath & planted with vines to create a green wall. This would offer the shops a green vista, create shade at certain times of the day, lower the urban heat island effect, add beauty & green up this area. It would also act as a windbreak as well as reduce the noise from passing trains. The railway station commuters would also benefit. I’d also create another green wall for the 45-metre length of brick wall that is beneath Illawarra Road & fronts onto Station Street. 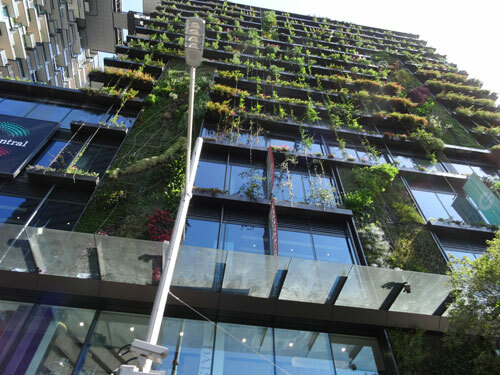 City of Sydney Council used steel structures that take up a minimum amount of space to create green walls under the overpass near the Pyrmont Fish Markets to great effect. Railcorp has done similar in Newtown. Vine covered structures would require far less care & could reach a much greater height than a hedge. If it has to be a hedge against this wall, I’d like it to be an Australian native that provides food for wildlife, like a Callistemon. I’d also plant a tall tree with a large canopy in each of the raingardens, because raingardens can be much more than just grasses. If the raingardens are where the Callery pear trees are meant to go, I’d change the species of tree to something that was evergreen & offered food & habitat to wildlife. One person suggested to me that tall-growing Eucalypts should be planted along the wall beside Illawarra Road where the hedge & new footpath is planned. These trees would match the Casuarinas across the railway line at the side of the old Marrickville RSL & the Eucalypts planted by Railcorp on the other side of Illawarra Road. They would do away with the Callery pear trees altogether & plant something that is useful to wildlife. If you want to have an input on how this ‘gateway to Marrickville’ will look, you will need to put in a submission. The deadline for submissions is 5pm, Friday 23rd March 2012. I would suggest that your submission also be forwarded to all the Marrickville Councillors as they will be the ones who vote on the final approval. Imagine something like this hanging from the shop awnings. City of Sydney Council placed hanging pots of Begonias along Glebe Point Road Glebe & they look very striking.